Passenger rail has been booming nationwide and in Michigan. Record-breaking ridership was recorded in 10 of the last 11 years (1) (2), and there has been a whopping 78% growth in Michigan ridership since 2002 (3). Last year alone, more than 800,000 passengers rode Michigan passenger trains. With all of this passenger rail activity in Michigan, the question often arises: what are the local economic impacts of these services? I mean, they’ve got to be good if demand continues to climb the mountain, right? Bingo! Here are the numbers. Amtrak spending: $13.6 million – the value of goods and services Amtrak purchased from or paid to Michigan suppliers and workers. To keep these numbers conservative, researchers did not include Amtrak spending in Michigan not directly related to operating train service here in Michigan. In 2011, a research team led by Benjamin R. Sperry of the Texas A&M Transportation Institute (TTI) expanded upon GVSU’s community benefits study to better quantify the economic impact of Amtrak rail service. In this study, the State of Michigan’s investments in passenger rail service was also factored into the mix. Since the GVSU study was published in 2009, Michigan ridership has increased 18% and both Amtrak and the state have increased their spending on Michigan services. Last year Amtrak invested $45.6 million in Michigan, combining both wages of in-state employees and overall Michigan procurement (6). In the current fiscal year, the State of Michigan is providing $45 million for passenger rail operations. Incorporating the state’s current funding for passenger rail with adjusted values from the benefit and community impact studies, the expected return on investment (ROI) is estimated to be $65 million through Amtrak procurement, Amtrak employee wages, traveler savings, and local business benefits. The best part about these ROI numbers is the potential it shows for re-establishing passenger service between Michigan’s east and west coasts. 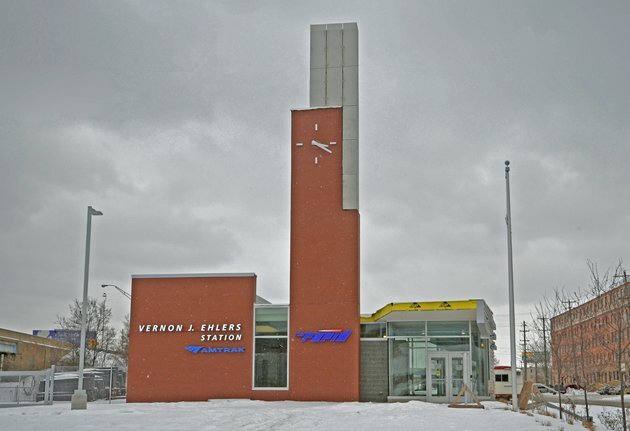 Consider this: The Holland-Detroit rail corridor via Lansing includes the top Michigan trip destinations from the Pere Marquette [Grand Rapids] and the Blue Water [East Lansing] (7), and plugs them into Michigan’s most active station in Ann Arbor (8). On top of that, the Holland-Detroit corridor also includes Michigan’s two most populous cities (9), 19 Michigan colleges and universities, the State Capitol, and top-notch medical facilities in Grand Rapids, Ann Arbor, and Detroit. Passenger rail’s enormous benefit to Michigan communities is why Michigan By Rail is working hard to get a new feasibility study of the Holland-Detroit rail corridor started. Passenger rail demand is rising, and this route is full of potential. If you’re interested in supporting this Coast-to-Coast project, drop me a line: dan@environmentalcouncil.org. There is a VERY bad misstatement in this article: a Grand Rapids-Detroit service WOULD NOT stop in Ann Arbor. The only way this is possible is by using a 40 mile “branch line” track from Lansing to Jackson that would require massive investment as it currently cannot accommodate train speeds over 10 Mph…even if this were done, East Lansing would be lost as a stop. A straight GRR-DET corridor could stop at Brighton or Howell, north of Ann Arbor on US-23. This is a very good article but PLEASE fact check everything. It’s nice to say this could serve Ann Arbor but it is very impractical and problematic at this point!